Hawaiian Resplendent angelfish larvae (Centropyge resplendens X C. fisheri) were raised from captive-spawned eggs at 77-79F on wild copepods and artemia. 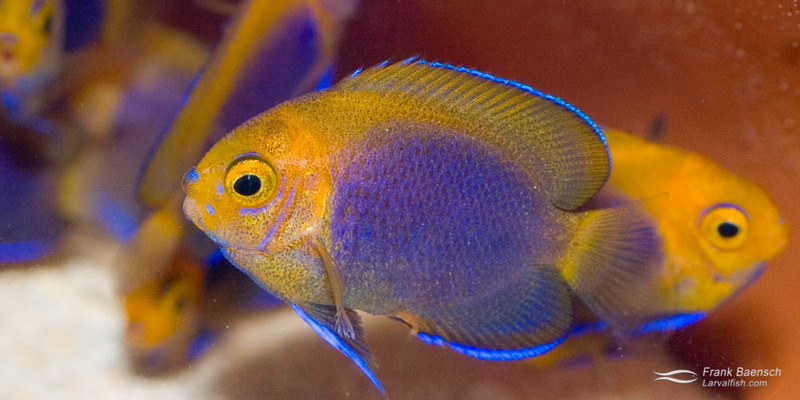 First record of Hawaiian Resplendent angelfish culture. I’m really excited about this one. Centropyge hybrids sometimes occur naturally between certain species (Lemonpeel x Halfblack; Eibl’s x Halfblack; Lemonpeel x Eibl’s; Flame x Potter’s; Flame x Sheppard’s; Coral Beauty x Sheppard’s; Herald’s x Bicolor and Venusta x Multibarred) that share the same geographic location. However, crosses between species inhabiting different oceans do not exist. I successfully paired one of my Resplendent males, an Ascension island endemic, with a female Fisher’s angel, a Hawaiian island endemic. The two began spawning regularly this summer, producing enough hybrid fertile eggs to work with for short time. The time spent breeding this hybrid was not in vain. The juvenile prodigy developed well with a distinctively beautiful coloration found nowhere else. The growth and settlement time of the hybrid larvae is more similar to C. resplendens than C. fisheri larvae.